The carburetors are running way to rich, so we're going to try to adjust that. Either the float level or the hopefully the jets are adjustable and we can adjust them to be more lean. The first thing was to take the gas tank out. There were no bolts holding the tank in place as there should have been, either in the front or back. You can take the fuel petcock knob off and in order to allow the tank to come out with the petcock still on it. So I removed the screw and pulled the petcock knob off. Next I started looking for where to take the fuel line loose. I see that the easiest place would be right on the fuel pump because its just laying loose. The fuel filter, between the tank and the fuel pump is mounted to the bottom of the tank as its supposed to be. 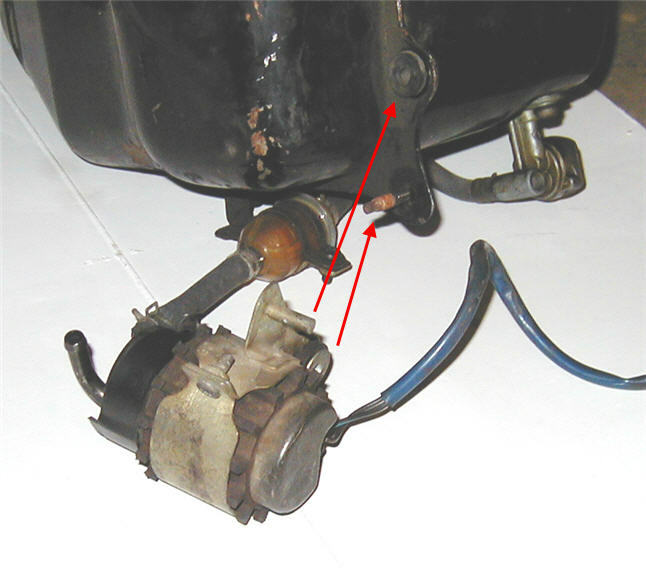 Shows how the fuel pump is supposed to be mounted to the bottom of the fuel tank. I eventually figure out that I can take the fuel line off the carburetor side of the fuel pump and take the fuel pump out with the tank. 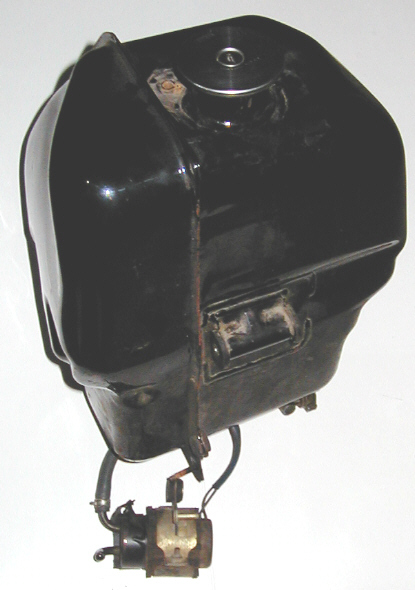 In fact, the fuel pump is supposed to be mounted to the tank, but its not. Its just laying there loose with one of the bracket ears bent over. So I finally get the tank and fuel filter and pump out all as one hunk. Now we're ready to start figuring out the how to get the carbs out. Now I've got the carbs out and am ready to start working on the jets and floats. 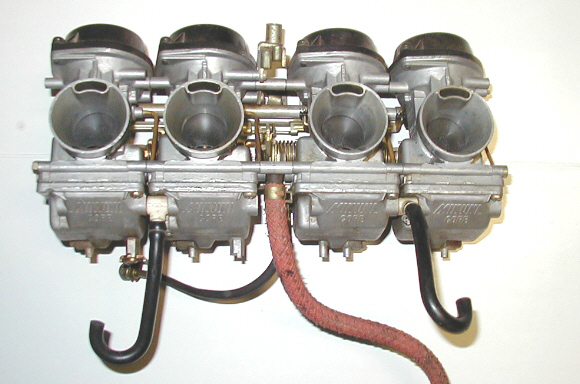 The carburetors, out and ready to come apart. Here is one of the jet needles. This shows how they can be adjusted. 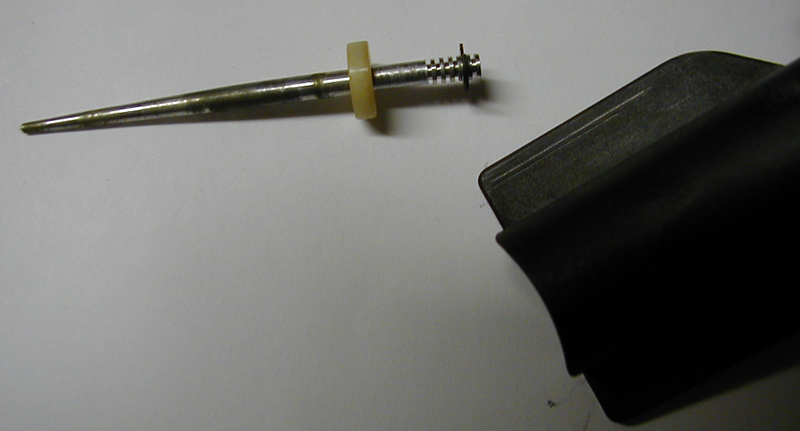 This is the needle, with the c-clip set as it is today in the carbs. You can see a little corrosion on the needle. 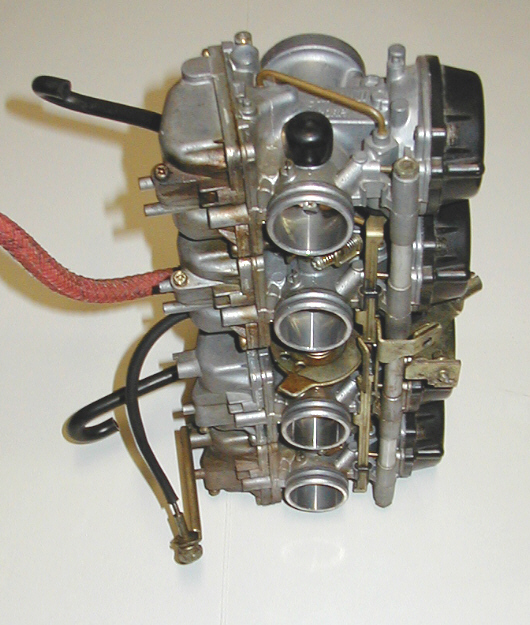 Probably is some wear in the jet as well, all of which will make the carb run rich. 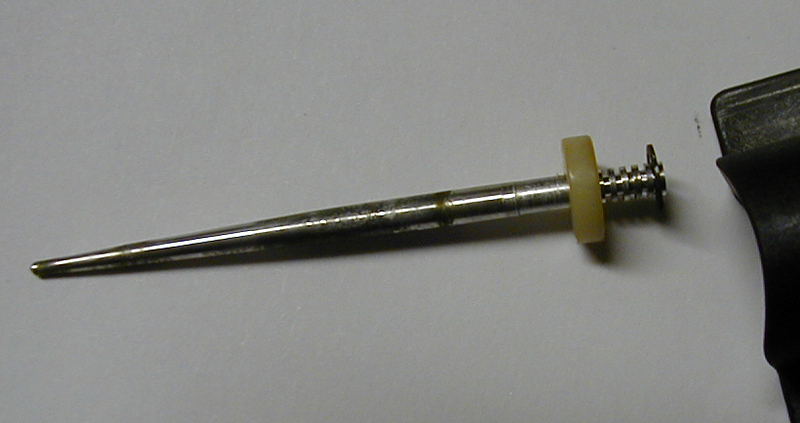 The needle with the c-clip set to the most lean setting. The big question is, do we set the jet needles to be more lean, or can we adjust the floats to make it run more lean? I think it may be easy enough to adjust the needles with the carbs back on the bike, so maybe adjust the floats with the carbs off, and then the needles if the float adjustment doesn't do the job. I got the fuel pump mounted back on the fuel tank as its suppose to be and secured with a lock nut. I had to redo the fuel line to make it reach with the pump mounted in the right position. Got the carbs back on the bike. I left the jet needles the way there were. I adjusted the low speed air mixture screw to 2 1/2 turns (they were set at 3 - 3 1/2 turns). I set the floats at 23mm, they were at 20mm. That's probably the major factor in running rich. The floats were set way too low. At least, let's hope that's it. I do have a problem with the throttle cable now. The return cable now seems way too long. I haven't figured that out yet. 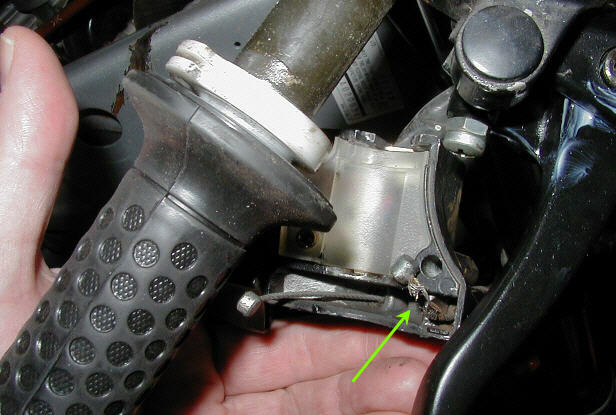 It would seem that something has come loose in the throttle grip. I found the problem with the return cable for the carbs... it had indeed come off the pulley in the throtle grip unit. And while I was finding that, I found that the throtle pull cable is nearly broken so we need to order a new throtle cable. Got the new cable installed and the carbs mounted. Finishing up the fuel tank mounting and the front frame bracket straightening and mounting then we'll be ready to fire it up..